When most people think of the expenses for their upcoming wedding, they think of the biggies like the reception, catering, and the wedding dress. However, there are other smaller expenses that also add up quickly such as the wedding cake, the bride’s maids and groom’s men’s presents, and the wedding invitations. To have a wedding that is memorable yet also doesn’t go over budget, prioritizing what is most important to you is important. While most people want attractive wedding invitations, they are not the center attraction of the wedding. Utilizing a few money saving techniques can help you have nice invitations that don’t cost a great deal of money so you have money to use on other more important parts of the wedding. 1. Consider shopping for invitations at alternative locations. Did you know that Costco offers wedding invitations? This can be a good place to order invitations as can a printing company. Consider other alternatives besides a stationery store. 2. Buy in bulk. Do all of your shopping in one place. Buy your invitations and thank you cards together. Many stores will give you a discount when you buy in bulk. Also, check to see if there is a discount for paying in advance. 3. Include a postcard for the RSVP. There is no rule that says your invitation must have a small RSVP card that requires its own self-addressed stamped envelope. Currently stamps are .45 cents, and postcards require a .32 cent stamp. If you send out 100 invitations, you can save $13 on the RSVPs, but you will save even more because the cost of using a postcard instead of a card and envelope will also lower how much you have to pay when you mail out the invitations. 4. Consider the weight of the paper. Obviously, you don’t want to order a very thin grade of paper, but think twice before ordering the heaviest weight paper. Remember, the more it weighs, the more it costs to mail. 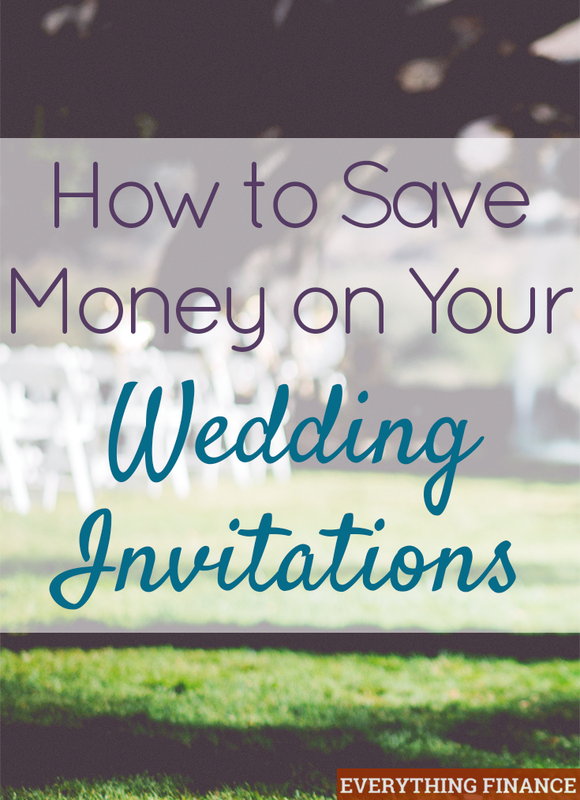 Instead, consider ordering a mid-weight invitation that won’t cost as much to mail. 5. Embrace simplicity. The simpler your invitations, generally the cheaper they are. You may want an invitation with a ribbon bow, but consider how much extra it may cost you and that when it arrives at your guests’ homes, it probably will not be in the same pristine condition it is when you mail it out. When we got married, we chose a simple ivory card with only embossed trim. I loved the simplicity (and the discount price). 6. Order extra invitations and cards. Inevitably, you will think of additional guests to invite or make a mistake when addressing envelopes. Have at least 25 extra invitations to handle these situations. Paying for the extra 25 invitations and envelopes is cheaper than running another printing if you come up short. Most people who are planning their weddings discover that unexpected expenses pop up more often than not. If you don’t want to have the average wedding that costs $27,000, find places to cut your expenses that doesn’t affect the quality of your wedding. Invitations may be the perfect place to start.